• Turn right on Pleasant Hill, go 2 houses or 1/10 of a mile and turn right on Nora Ave.
Casa Carolina is located 55 miles north of San Francisco. In 1.5 hours after leaving your plane at SFO or 1 hour from the Oakland Airport you can be in a Vacation Rental in the heart of Sonoma County wine country. 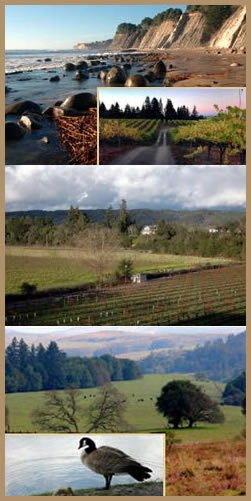 Wineries in the Russian River Appellation are minutes from Casa Carolina. Healdsburg is to the north and the town of Sonoma is to the southeast. Your stay is centrally located for great days of wine tasting and exploring the area. La Casa is located on the first property in the countryside bordering the town of Sebastopol. Sebastopol is your best choice for a convenient location to the 2 major regions in Sonoma County for wine tasting. This small town has a variety of beautiful shops, antiques, a Sunday Farmers Market and a highly awarded array of small restaurants. Sebastopol is surrounded by rolling hills of vineyards, Gravenstein Apple Orchards, many bike trails and a large laguna preserve. The Pacific Ocean is 20 minutes to the west with many public beaches and the fishing village of Bodega Bay.